Eric Smidi Smith, born January ***** in Covington, Kentucky. Smidi is a self taught musician. His interest in music started in 1968. His primary instruments are the Bass and Lead guitars. Smidi was the bass guitarist for The Python Band Cincinnati, Ohio from 1977 to 1980. The name SMIDI derives from MIDI (musical, instrument, digital, interface) Smidi joined the US Air Force in 1981 and he retired as a Technical Sergeant / E6 in 2001. During his military career 1983 Smidi auditioned and was selected to tour as the lead guitarist with the Air Force Tops-In-Blue Entertainment Showcase Group. In 1990 Smidi was assigned to Nellis AFB, Nevada where he was introduced to MIDI instruments and equipment. He quickly learned that he could sequence all of the musical instruments from a common computer source. 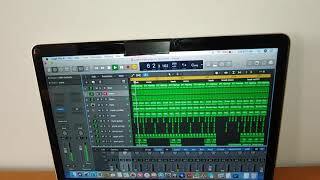 Since discovering the use of MIDI equipment in 1992 Smidi has sequenced music tracks for artist i.e. Leon Haywood, Keith Wilder (Heatwave) Charles McCormick (Bloodstone) Spice 1, New Birth, Bobby Jones, Jesi Terrell, Clay Hammond, Chuck Roberson, Green Eyez, EMC, D C Clark, The Next Band, Suspect, SWT, Jeter Jones, Cupid, Johnny Rock Cee, Lonnie Gordon, Geno “G-Love” Stanley, Billy Jack Hewitt, Bee Smoothe, Kroshet, Simply Smooth and Ghetto Cowboy just to name a few. Smidi produced the boxing intro music track for Floyd Mayweather Jr. at the MGM Grand Hotel Las Vegas, NV 2001. Smidi produced the music for the song “Imitation Tears" performed by Dewayne McCoy featured in the movie "Love Beat The Hell Outta Me" featuring actor Terrence Howard from the hit FOX TV show Empire. Smidi produced the song “Place Of Peace featured on the "Gang Tapes" 2003 soundtrack. He also produced the title theme song “I Wanna Be A Hero for the independent film HEROS 2008. Smidi’s background music is used on many Youtube videos to promote the video games i.e. Grand Theft Auto IV and V, Channel Frederator, and Reactions, and many other Youtube channels. Smidi has over 2400 registered song titles with ASCAP. His goal is to achieve recognition as a well rounded successful musician in multiple genres.